A learning collaborative uses an empowerment model designed to support the growth of family child care (FCC) providers as they learn, change, grow and become champions for children’s health, development and learning. Brings together a community of providers. Establishes a network of shared ideas and mutual support. Provides access to resources for quality improvement. Provides opportunities family child care providers can use to enhance important skills: implementation of best practices, establishing a nurturing environment, as well as training to increase leadership. The following materials were used in an expansion of the National Early Care and Education Learning Collaborative Project. Funded by The David and Lucile Packard Foundation, Contra Costa Child Care Council serves as the partnering organization implementing the learning collaborative model. This project was designed to promote healthy eating and physical activity in licensed family child care homes serving children birth to age five in Contra Costa County, CA. To remain consistent with the CDC funded National Early Care and Education Learning Collaborative Project, which focused on early care and education programs, Contra Costa Child Care Council kept similar themes of the model making slight revisions. These revisions include: developing a Family Child Care Edition of the Taking Steps to Healthy Success curriculum, decreasing the amount of in-person Learning Sessions, decreasing the number of training hours and providing individualized on-going technical assistance. The collaborative project is set to conclude December 2016. For more information on the project, please contact Lauren Brightwell, Project Coordinator, Contra Costa Child Care Council, at lauren.brightwell@cocokids.org or 925-265-6492. The following materials were used in the Step It Up: Taking Steps to Healthy Success Learning Collaborative Project, which was designed to promote healthy eating and physical activity in licensed family child care homes in Kansas serving small groups of children birth to age five. Step It Up adapted the National Early Care and Education Learning Collaborative (ECELC) Project model and curriculum for use with family child care providers. Step It Up revised the model to better accommodate family child care providers through decreasing the amount of participants per collaborative, decreasing the amount of in-person Learning Sessions, providing individualized on-going technical assistance and adding Peer Learning Community Meetings (PLCM). At the end of the project year, knowledge of ways to successfully implement a learning collaborative were reflected through lessons learned. For more information on the Step It Up project, please contact Christi Smith, Project Manager of Early Childhood Wellness, Child Care Aware of Kansas, at Christi@ks.childcareaware.org or 816-645-0550. Please feel free to adapt the following materials for your family child care collaborative. Each four hour Learning Session contains content on childhood obesity prevention strategies through healthy eating, physical activity, reduced screen time and breastfeeding support. Upon completion of each Learning Session participants are provided an Action Period Task to guide them as they implement healthy changes. Learning Sessions last 8-10 weeks. Participants engage in Peer Learning Community Meetings to support the Learning Sessions and promote discussion. The meetings allow participants an opportunity to share ideas and resources, connect as professionals and discuss how they apply learning strategies into their family child care home. 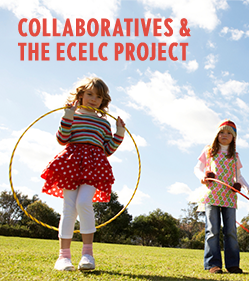 The National Early Care and Education Learning Collaborative (ECELC) is an intervention project aligned with the goals of LMCC, with more than 35 collaboratives.